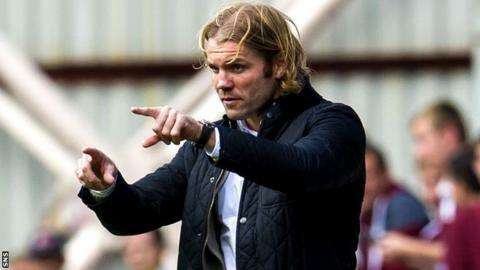 Hearts boss Robbie Neilson has been voted Scottish Championship manager of the month for August. The Tynecastle side boast a 100% record in the division after winning all four of their league matches last month. "I'm pleased with the boys so far," Neilson said. "It's not just for me [the award], it's for the rest of the squad and coaching staff at the club, all the guys are working really hard to try to push the club forward." Hearts opened the league season with a 2-1 win over Rangers at Ibrox and defeated Edinburgh rivals Hibernian the following week. Victories over Raith Rovers and Falkirk followed and Neilson's side also progressed to the third round of the Scottish League Cup. "We've started the league well but there's a long way to go for us, a lot of games," Neilson added. "Ultimately it's down to the players to do it on the pitch, and they've been doing that. They've been working hard in training, doing a lot of extra sessions, I'm pleased with them. "I have belief in myself anyway. I don't need an award to have belief in myself but if I'm still picking them up at the end of the season that will be the main thing. The main task for us is to get promoted and if we do that I'll be happy." Neilson became head coach at Hearts in the summer after Gary Locke's spell as manager came to an end.